The PIMCO Total Return Fund notched the worst risk-adjusted returns among 16 similar funds ranked by Bloomberg. 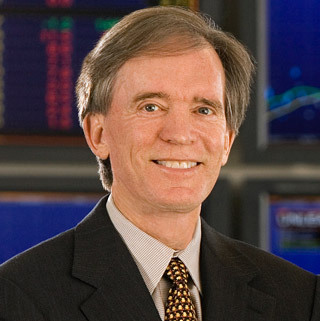 Bill Gross is taking investors in his $232 billion PIMCO Total Return Fund for a rough ride. The world’s largest bond fund produced the worst risk-adjusted return over the past year among 16 U.S. intermediate- term funds with at least $5 billion in assets, according to the Bloomberg Riskless Return Ranking. As shorter-term debt tumbled in anticipation of rising interest rates, Gross’s fund posted the second-worst returns and second-highest volatility in the group. The PIMCO Income Fund, run by Daniel Ivascyn, had the second-best performance with the third-lowest price swings. Volatility has increased in the PIMCO Total Return Fund for each of the past three years, reducing risk-adjusted gains for investors in the fund. In the past year, the price swings have come with declining returns as Pacific Investment Management Co.’s co-founder Gross misjudged the timing and impact of the Federal Reserve’s plan to reduce stimulus. Gross has been betting on 5-year Treasuries, a wager that went bad as the yield on such debt more than doubled since May. PIMCO Total Return Fund declined 1.2 percent in the year ended March 31, trailing 88 percent of similarly managed funds, according to data compiled by Bloomberg. The fund’s volatility was 4.3, compared with the 3.6 average for the group. Over the past five years, PIMCO Total Return’s risk-adjusted return ranked 10th out of the 15 funds that have been in existence since then. Higher price swings mean the price of an asset can move dramatically in a short period of time, increasing the potential of unexpected losses compared with a security whose prices are stable. Bloomberg’s risk-adjusted return is calculated by dividing total return by volatility, or the degree of daily price-swing variation, giving a measure of income per unit risk. The returns aren’t annualized. Former Chairman Ben S. Bernanke’s suggestion last May that he might scale back the Fed’s bond-buying program caused a sell- off in PIMCO Total Return’s holdings of intermediate-term U.S. Treasuries and inflation-linked bonds. Last month, Fed Chairman Janet Yellen signaled that rates could climb sooner and faster than previously forecast, triggering losses in short-term bonds, the heart of Gross’ portfolio. PIMCO Total Return had 79 percent of its portfolio in bonds with maturities of 5 years or less as of Feb. 28, according to the Newport Beach, California-based firm’s website. The fund had a short position in bonds with maturities of 20 years or more, which means it was counting on those securities to decline. Over longer stretches, Gross has done better. PIMCO Total Return had a higher absolute return than at least 95 percent of rivals over the last 10 and 15 years, according to data from Chicago-based Morningstar Inc.
“Bill Gross has done an exceptional job over the long term, and in my view, he will continue to do well compared to the benchmark,” said Joshua Emanuel, chief investment officer of Elements Financial Group LLC in Irvine, California, where he oversees $450 million. Gross’s fund is typically measured against the Barclays U.S. Aggregate Index. Gross, 69, who co-founded PIMCO in 1971, has faced other challenges this year. In January his heir apparent, Mohamed El- Erian, unexpectedly announced his resignation as chief executive officer. His departure was followed by reports of tension between the two. Gross lashed out at El-Erian in a June meeting as performance stumbled and withdrawals continued, two people familiar with the matter said this year. PIMCO Total Return suffered record redemptions of $41.1 billion last year, based on data from Morningstar. Clients pulled an estimated net $3.1 billion from the fund and $7.3 billion from all of PIMCO’s U.S. mutual funds in March, Morningstar’s data show. That’s even as investors put $11.6 billion into bond funds last month through March 19, according to estimates from Investment Company Institute, a Washington- based trade group. The redemptions don’t include institutional accounts. PIMCO’s assets under management declined to $1.91 trillion as of Dec. 31, from a peak of $2.04 trillion last March. The $9 billion Lord Abbett Bond-Debenture Fund had the best risk-adjusted return of 2 percent in the 12 months through March 31, combining the highest total return with above-average volatility. Ivascyn’s $33 billion PIMCO Income Fund gained 1.5 percent, with the second-highest return along with modest volatility. Ivascyn was named one of PIMCO’s deputy chief investment officers in January following El-Erian’s decision to leave. He and his co-manager on PIMCO Income, Alfred T. Murata, were named fixed-income managers of the year for 2013 by Morningstar. The fund, which has outperformed 98 percent of rivals over the past five years, has benefited from its exposure to mortgage-backed securities, a bet on the recovery of the U.S. housing market. Steven Roge, an investor in both PIMCO Income and PIMCO Total Return, said the two funds aren’t comparable. He described PIMCO Income as a go-anywhere fund that specializes in bottom-up research. Gross’s fund, by contrast, is a more traditional bond fund that cannot stray too far from its benchmark. “They are two different beasts,” said Roge, a money- manager with Bohemia, New York-based R.W. Roge & Co, where he helps oversee $225 million. In its December “Strategy Spotlight,” PIMCO wrote that the Fed’s plans to keep interest rates low were more important than its decision to taper its bond purchases, and as such, PIMCO’s funds would concentrate on short-term debt while pulling back from longer-dated securities. The Fed’s Yellen said last month that the central bank’s key interest rate might rise by the middle of next year. At the same time, Fed officials predicted their target rate will be 1 percent at the end of 2015 and 2.25 percent a year later, higher than previously forecast, as they boosted projections for gains in the labor market. The surprise announcement triggered a selloff in the 1-5 year bonds Gross holds, prompting his fund to trail 73 percent of peers after posting a 1.3 percent return in the three months ended March 31. For the first quarter, U.S. Treasuries of 20 or more years in maturity gained 7.6 percent, according to a Bank of America Merrill Lynch index. “What happened in the first quarter was just the opposite of what the market had been expecting,” Kenneth Taubes, chief investment officer at Boston-based Pioneer Investment Management Inc., said in a telephone interview. Taubes, who anticipated that short-term rates would rise as the economy strengthened, positioned his portfolio in a way that took advantage of shifts along the yield curve. His $1.6 billion Pioneer Bond Fund gained 2.6 percent this year, better than 82 percent of peers, according to data compiled by Bloomberg. Gross has said on a number of occasions this year that investors are misreading the Fed, focusing too much on the improving economy and paying too little attention to the lack of inflation in the U.S. In the absence of inflation, the central bank will be in no rush to increase rates, Gross has said. No matter how Gross’s call on rates and the Fed turns out, investors need to keep his short-term troubles in perspective, said Eric Jacobson, a senior analyst with Morningstar, which has maintained its “gold” rating on PIMCO Total Return Fund.